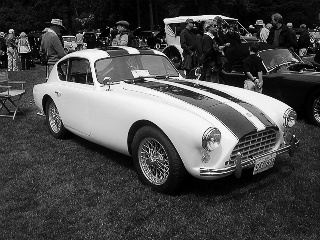 The AC Aceca sports car, launched in 1954, was a two seater, fixed head coupe, and based on the AC Ace. It was designed as a hand made Grand Tourer in the old British tradition, with aluminium body panels over a steel chassis, and featured parts of the interior, such as the dashboard, door frames, and tailgate, decked in ash wood. 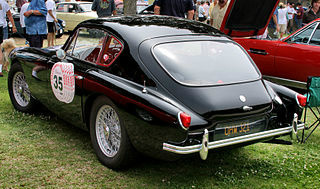 A distinctive characteristic was the hatchback at the rear and, at that time, the Aceca was the only car to incorporate this feature, apart from the 1953 Aston Martin DB2/4. It has been suggested that the body styling of the front section of both the Ace and Aceca bore a striking resemblance to part of a design for AC suggested by the famous Pininfarina in the late 1940's. Fitted with a Moss four speed gearbox, early models were powered by AC's own straight 6-cylinder, 2 litre, overhead cam engine, developing 100 bhp, and with a top speed of 108 mph. However, in 1956 Bristol Cars, who specialised in building hand made luxury cars, offered its straight 6-cylinder, 2 litre engine, fitted with three SU carburettors, as an alternative unit. 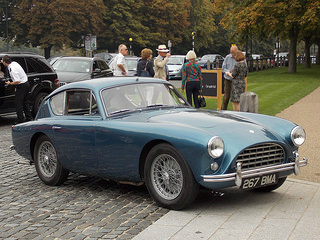 This car was designated the AC Bristol, and developed 130 bhp, with a top speed of 118 mph, and a 0-60 mph time of 8.2 secs. The Aceca Bristol sports car, as it was now called, was also available with a lesser tuned, Bristol B-Type engine, which developed 105 bhp. It had a near perfect fore/aft weight distribution which helped to produce exceptional handling, especially on loose surfaces and dirt tracks, which made it popular in historic racing circles. Due to its stiff suspension, the ride was inclined to be hard, and there was a tendency to oversteer, although handling was still regarded as solid and predictable. Furthermore, some customers made adverse comments concerning the heating system, which was inadequate in colder climates, and that soundproofing, when driven above 75 mph, was ineffective. In 1961, AC discontinued its own straight, 6-cylinder engine, which had been designed by John Weller, the company's founder, in 1919. Between 1961 and 1963, an Aceca variant was offered powered by a Ruddspeed tuned 2.5 litre, 6-cylinder, Ford Zephyr saloon engine, which developed 170 bhp, produced a top speed of 130 mph, and a 0-60 mph time of 8.1 secs. In order to cope with the additional weight of the Ford engine, the front suspension was strengthened. One of the advantages of the Zephyr engine was that it was inexpensive to service. This Aceca variant displayed some subtle body styling changes, such as a lowered bonnet line, and the front section being more oval in shape and slanted forward. However, designated the Aceca 2.6 sports car, only 8 of these units were ever built. Although the Aceca was marginally heavier than the Ace, its top speed was greater owing to the fact that its lines were more aerodynamic. Production ended in 1963, with 151 Acecas and 169 Aceca Bristols having been built, when all AC production was centred on the AC Cobra. A 1954-63 AC Aceca in beautiful condition would command in the region of £120,000/$190,000.